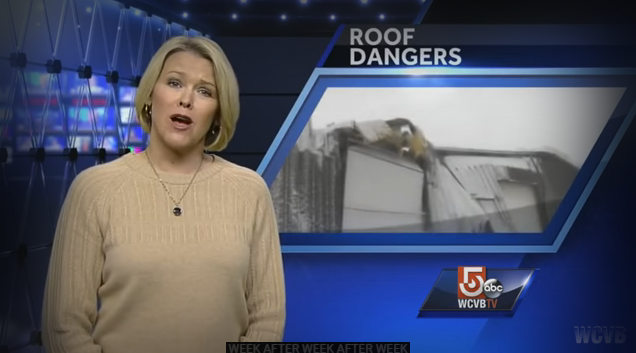 Beware Of Rooftop Snow! Do You Know The Dangers? Snow on rooftops provide insulation for the house or structure it is covering. Although snow is cold, it is also compact and allows less heat to escape from the rooftop. Heat is then trapped inside the building and helps warm it. That’s why igloos are cool! But how much snow is too much? According to AccuWeather, snow can weaken the structure of a building and cause it to collapse. This happens more often on flat roofs because snow does not easily fall or melt off a flat surface. 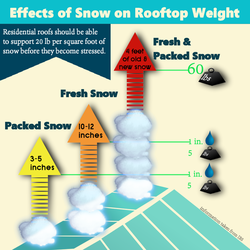 If you live in areas especially prone to heavy snowfall, check to see how much snow your roof can take. Given our expertise, we are happy to check this for you. With the information provided in the infographic above, a typical house, under typical snowy weather conditions, should be able to support 12-20 inches of packed snow and 40-48 inches of fresh snow. Snow left to accumulate can cause your roof to cave in, especially if the snow towers over you, weighing an agonizing 60 pounds per square foot! 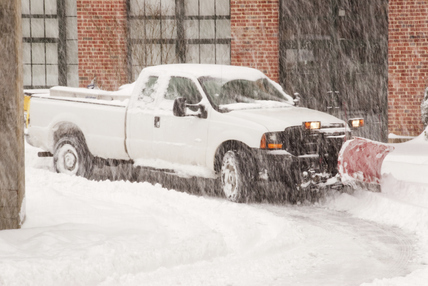 We, at Ogden Snow Removal, have taken into account all the snow removal tips, advice and safety precautions to help you remove the weight from your rooftops. With advanced snow rakes and removal systems, we can scrape snow from roofs where applicable. For cumbersome rooftop snow masses, we can climb your roof to physically shove the snow off. In either case, we finish the job by plowing or shoveling the snow off of the ground below. While it may seem like a foolproof plan to shovel or rake snow from your roof, accidents and injuries have occurred. This is why it is important to hire a professional snow removal company with rooftop snow removal safety and training. We always send out more than one roofer with proper tools like ladders and harnesses. This keeps everyone safe and the structure of your home goes undamaged. And because we understand the dangers of rooftop snow, we recommend a seasonal contract so we can monitor expected snowfall to immediately come out and service your roof in efforts to save it from collapse. Don’t wait until it is too late! ROOFTOPS DO CAVE IN due to weight bearing snow and this happens more often than you think! In 2006, in Europe a heavy snow load collapsed a roof and killed 65 people. In 2014, New York suffered many roof collapses which resulted in thousands of dollars’ worth of damage; luckily no injuries were reported in many of these cases. Bottom line, Ogden Snow Removal wants to keep you safe whether you need residential or commercial rooftop snow removal. We never underestimate the harmful effects of rooftop snow and you shouldn’t either. Call us today and we’ll make your roof our priority!